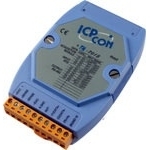 The I-7000 series of I/O modules provide a wide range of distributed intelligent sensor interfaces. Systems can be designed using the various I/O module building blocks. A wide range of software tools and drivers are available to connect to SCADA packages such as our Orchestrator software. There are also versions of most of these products which can communicate using the ModbusRTU protocol (M-7000 range). For more information, please call us. A wide range of Analog Measurement Devices are available to allow connection of most sensor types. Some of the single channel Analog Units also have Digital I/O on-board for triggering and alarm reporting. Providing a wide range of Digital Units, inclduing Inputs / Outputs / Counters / AC type / DC type. A range of Data Converters/Interfaces/Repeaters/Hubs to connect I-7000 (& other RS232/422/485) Units to a host computer.